Russia represents a greater threat to Finland, according to a new report out on Tuesday. The Finnish Institute of Foreign Affairs says that Finnish decision-makers have to be alert to Russia's use of energy policy in geo-politics, and the lack of western-style market mechanisms in Russia. Finland faces a greater threat from Russia, which may manifest itself in a more aggressive approach and the politicisation of energy partnerships, according to a new report out on Tuesday. The Finnish Institute for Foreign Affairs (FIIA) says that Russia's new posture in foreign affairs means Finland needs better crisis readiness. Energy policy is a concern, according to the report, with Russian and Finnish interpretations of the Fennovoima nuclear power project diverging significantly—Russian policy in several countries has been to try and create dependencies. The Fennovoima nuclear power plant to be constructed in Pyhäjoki on Finland's west coast will be built by a consortium in which the Russian state-owned nuclear contractor Rosatom is both a part-owner and the main supplier of the facility. As an example, the report quotes from the Finnish Intelligence Police's annual review, which stated that a key goal of Russian intelligence in 2015 was to influence Finnish energy policy, and says that attempts to influence Finnish policy are likely to continue. The report's conclusion suggests that there are several risks emanating from Russia, and the key policy response from Finland should be to invest in and improve the country's resilience to withstand turbulence in many different spheres away. • Finnish operators should avoid major strategic investments in Russia for the time being because of economic uncertainty in the country. • Finland should maintain bilateral relations with Russia but keep EU partners informed at all times. Finland could otherwise be in a risky position. • Finland should signal to Russia it wants to maintain close economic and cultural links, but at the same time make it clear that Russia's actions in breaking international agreements are not acceptable. • Finnish decision-makers should understand how dependent relationships figure in Russian policy. Finland should take care to ensure that EU policy on Russia is united and based on realistic analysis, and should make clear to Russia that Finnish officials do not operate under political instruction. • Finland has to invest in quick, credible official communications. 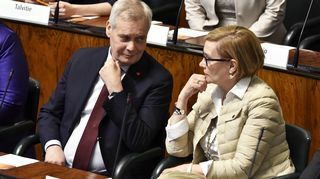 Confirmed attempts to influence decision-making should be publicly disclosed, and minority groups—particularly Russian-speakers—should be well integrated into Finnish society. • Finland should continue close military co-operation with western partners at all levels, as well as preparing for operations in so-called 'grey areas' different from traditional military conflicts. • Finland can't prepare for internal tensions in Russia, but should try to continue co-operation with environmental, regional and Finno-Ugric bodies anyway.